Volkswagen sold 208,462 cars in the UK in 2017. In China, it sold 341,888... in December alone. Across last year, VW’s three Chinese operations – its own brand and two joint ventures – delivered 3,177,000 cars, accounting for just over half the company’s 6.23m global sales. That total, equating to 8704 sales per day, or one every 10sec, makes VW the best-selling car firm in China and explains why boss Herbert Diess says “China will have a decisive effect on the success of our future strategy”. Both the sheer size of the Chinese car market – 24.2m cars were sold there last year – and its potential for further growth explain why it is a priority not just for VW but for almost every global car firm. That, in turn, is why just about every major current global trend in the car industry can be traced back to China. The three biggest current car trends in the automotive world – namely SUVs, connected cars and electrification – are all being accelerated by China. Since 2012, sales of saloons in China have remained static,Boyue maker Geely was third-leading car firm in China in 2017 while SUV sales have increased by more than 10 million per year and now account for half the total car market. That’s why VW will expand the range of SUV models it offers in China from three to a dozen by 2020. Chinese buyers are drawn to SUVs because of the prestige of bigger vehicles (hence the number of elongated saloons sold in the country). Chinese tastes are also why many SUVs, such as the new Touareg, are getting front designs that are bold by European standards. The SUV growth is driven by youth: 65% of cars in China are sold to first-time buyers, and the average age of car buyers is 34, compared with mid-50s in Europe). That younger demographic is also demanding connected cars: the country has 350m smartphone contract subscribers, and the online shopping industry is worth £532 billion. China’s electric ambitions Younger buyers are keen on electrified cars too, but that push is being driven by the Chinese government, which has introduced tough CO2 rules to accelerate growth in new energy vehicles (NEVs) as a cornerstone of its ‘Made in China 2025’ initiative. 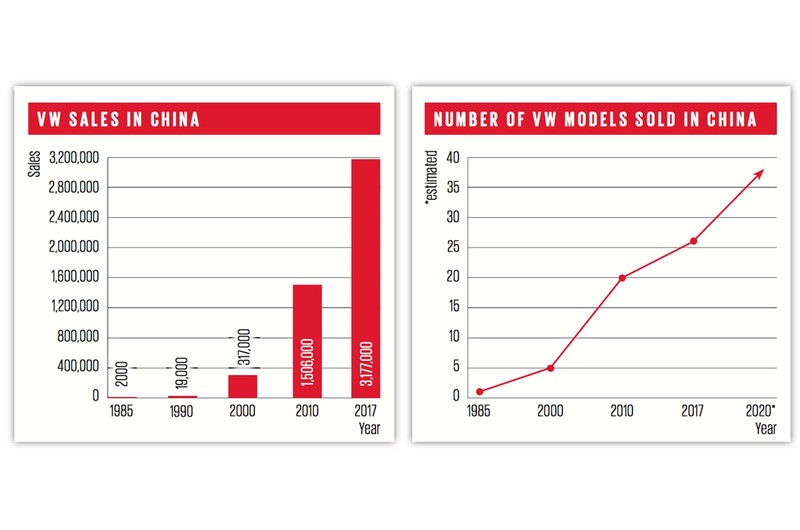 VW has had a presence in the Chinese car market since 1984 and has become the largest manufacturer in the country through a three-pronged approach. It initially entered China with a joint venture, the Shanghai-based SAIC Volkswagen, and in 1990 launched a second, FAW- Volkswagen, in the north- eastern city of Changchun. The third prong is Volkswagen Import, based in Beijing. Each of the three companies is focused on different regional markets and has a unique model line-up. VW sales boss Jürgen Stackmann says the firm works to ensure equality between the two joint ventures, which have roughly the same number of dealers and models. That’s why VW is greatly expanding its line-up of Chinese models and why, for example, the company has launched two similar-sized China-only SUVs: one will go to each joint venture. How does VW decide which one gets which model? “It can be a big fight,” says Stackmann. In 2010, just one of the eight- most-popular car makers in China was Chinese – and Chery sneaked onto that ranking in eighth place. Last year, three of the top eight car firms were Chinese, with Geely third (behind VW and Honda), Baojun seventh and Changan eighth. The interesting dynamic is that although global firms have long dominated in Beijing and Shanghai, the growth of the home brands has come from the regions. The Chinese car makers have embraced their lack of legacy, fuelling growth with bang-on-trend electrified SUVs. Their models are no longer copycats of European designs, either; VW’s China boss Stephan Wöllenstein describes modern Chinese cars as “great products”.